Beginner / Entry Level Ski – perfect for Kids! 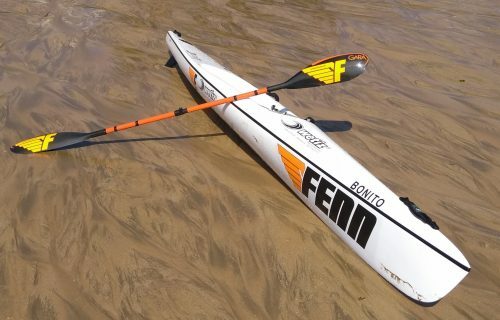 The Fenn Bonito is a small fun surf ski, ideal for youngsters but also accommodates adults up to 75 kg & 175 cm tall. With the same surf ski characteristics of the rest of the Fenn range, this ski will prove to be popular amongst the kids and smaller adults looking to get into surf ski paddling. Available in Poly-vac construction with a finished weight of +- 12 kg. Fenn have moved away from the traditional hand laid fibre glass construction. Fenn now vacuum bag all layups which gives a consistent weight and even spread of resin throughout the ski. Another benefit of the Poly Vac construction is the boats a slightly stiffer and generally lighter than the hand laid option.